Register Log In A Gardeners Forum Forums Gardening in 2007 Mystery weed behind my forsythia. Some kind of sumac, or what? that looks like a black walnut sapling to me. I have to yank 'em up all the time.........stupid squirrels. Why do they gotta plant it right up next to my house?? Grrr. A sumac, I'm sure - we have a forsythia clump at the side of the parking lot and sumac grows in there too. 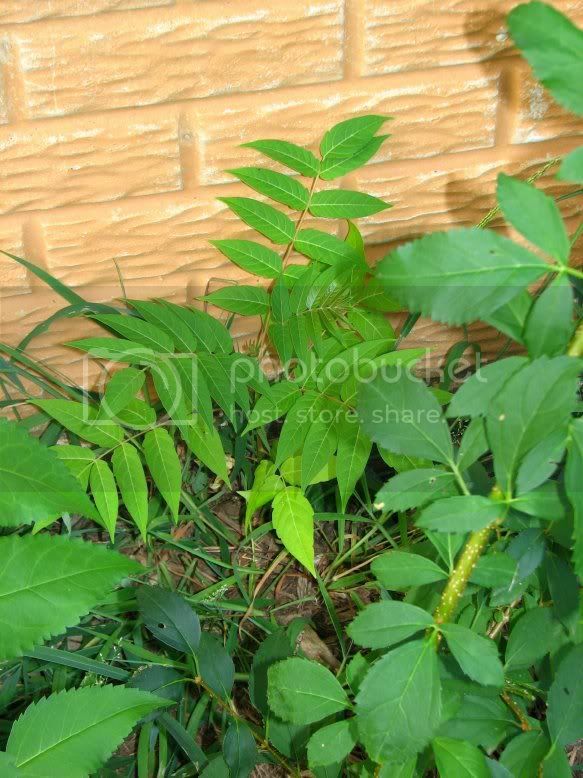 Is that the same as poison sumac? That is ailanthus 'tree of heaven'. A pretty little tree w/ more keys than a maple & propagates readily. They look similar to the sumacs, but are not toothed. The have that tell-tale notch toward the base of the leaf.